Don't base it on any particular time period of either show, perhaps even base Beast Wars within the Mini Comic continuity. But I think the two together would work really well. Both of those ideas rock! Transformers vs Gundam would be fun, preferably a wacky G Gundam style though. Zeon or EFSF vs Autobots or Decepticons sounds kinda like a snooze. Also Transformers vs Mario. I don't know how it would work either. Most Sunbow animated shows, and some Hasbro properties would be great. GI Joe has been done, but I'd love to see TF crossover with Robotix & Inhumanoids. Battle Beasts *technically* has been done already, but I'd love to see more. o.supreme wrote: Most Sunbow animated shows, and some Hasbro properties would be great. GI Joe has been done, but I'd love to see TF crossover with Robotix & Inhumanoids. Battle Beasts *technically* has been done already, but I'd love to see more. So the first part of post-Rev GI Joe was building to Inhumanoids pretty unambiguously. Yet somehow, when it's time for the big reveal, it was Fatal Fluffies all along. Bad writing? Nope. Apparently there was some sudden and unanticipated murkiness on who owns the IP so they shuffled plans. I don't know any details that are more solid than this, unfortunately. I would have liked to see more of Jem get integrated in IDW beyond the acknowledgements by creative that their comic was in the same universe, a Misfits poster, and Rock 'N' Roll's history as their roadie. Too late now, it would seem! Actually, the IDW Jem series CAN’T be in the same universe as the rest of the books. Rock was one of the early Joe recruits back in 2006, and he roadied for the Holograms prior to that. In the Jem series, the band is formed in the present around 2015. Which means we have an Earth 2-type situation, where the Holograms and Misfits of the Hasbro Universe are about 10 years older than their main Jem series counterparts. Incidentally, this also makes the Misfits the Hasbro Universe’s equivalent of American Idiot-era Green Day and other early-2000s pop punk bands. But I digress. Personally, I would’ve liked to have seen more elements from Air Raiders. I mean, I know Bludgeon referenced Airlandia in Transformers: Salvation, but that was it. Also, I really would’ve liked to have seen some of the Super Joe characters worked in, like Darkon or Luminos. 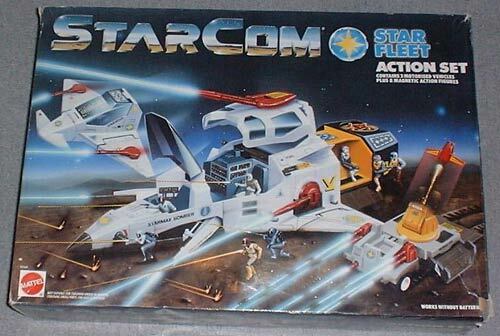 So who owns Starcom now? This was another series that, although the cast were all humanoid size and shape, could work very well as a crossover with Transformers. Due to the multifaceted vehicles used in the show. Obviously you could ditch the dated jingoism (as Mattel did when they brought the original toys to Europe) and you could apply the characters to any planet in the Transformers universe. Exactly. I think Starcom didn't do as well outside the States for the same reasons GI-Joe is still irrelevant outside the US; All the patriotism. Once that's out of the way, both are quite interesting. primalxconvoy wrote: Exactly. I think Starcom didn't do as well outside the States for the same reasons GI-Joe is still irrelevant outside the US; All the patriotism. Once that's out of the way, both are quite interesting. I find you have to be very careful how you market things like that. For example, it was only with the release of the MCU films Captain America found an audience outside of the US. They clearly toned down a lot of the more overt propaganda to do so. Likewise how they largely dropped that angle with Superman altogether, as well as half the title of the Justice League (of America). That implies G.I. Joe is relevant in the US. A random display I assembled on my desk recently. Bucky O' Hare X Beast Wars could work surprisingly well. 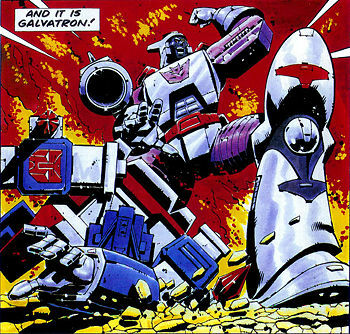 Megatron would find a strong ally in Toadborg and/or Komplex. Infiltrating the Toad army wouldn't be too hard for the Predacons either (yes I know the above are frogs, but that is just semantics). By the same token, the Maximals could be quite at home onboard the Righteous Indignation. 4,181 pages were recently viewed by 778 unique visitors. This page was viewed 1 times on Saturday, April 20th 2019 4:08am CDT. © 2019 Seibertron, Inc. DBA Seibertron.com. All Rights Reserved. Established June 2000. Seibertron.com is owned by Ryan Yzquierdo.